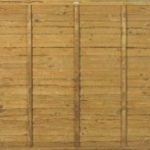 All the fence panels featured on this page are available from stock with delivery in 2-5 working days. For information on choosing and installing your fence panels, please see our guide below. Tanalised (Pressure Treated). decorative panel. Decorative panel with trellis incorporated. All our 3ft options in one place..
All our 4ft options in one place. All of our 6ft high options in one place. Featheredge through to picket. Also known as waney edge or larch lap. 3ft high through to 6ft high variations. If you need a garden fence that is quick to install, easy to replace when damaged and cost effective then our panels are the ideal option for you. Our fence panels can be easily installed using only a small selection of hand tools. Simply install either a wooden or concrete post, place your panel and get the mark for the next post. If you have a damaged unit, lift it out of the line and slot a replacement in. Overlap and feather edge variants are available in industry standard imperial sizes so interchanging units is easy. Are you looking for privacy or decoration? Need to close off a boundary line or create privacy screens to hide the compost heap or the shed? We have a range of fencing panels for sale to suit every budget and every situation. Our basic overlap panel is a great starting point, six foot wide and available in a variety of heights from three feet through to six feet. These offer privacy at the best price. If you want to add a little decoration try adding trellis to the tops of the fence line. Overlaps can be used with concrete posts and gravel boards or with traditional wooden posts. Looking for a heavy duty option? Opt for a feather edge fencing panels. These are fully framed offering high levels of rigidity. Traditional feather edge boards offer good levels of privacy and these panels can be topped with trellis for extra height and decoration. Available in standard six foot widths and in heights of 3ft through to 6ft they can be nailed/screwed to timber posts or used with slotted concrete posts . Want a high level of decoration that sets your fence apart from the crowd? Choose from our range of decorative fencing panels. 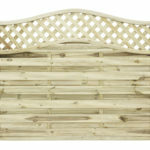 Our decorative options come with built in trellis complete with a wave top for high levels of decoration. Fully framed and with inset fascia boards, these fencing panels are a great “two sided” option with strength and durability combined. These panels are created in metric sizes so do not generally fit between existing posts where overlap or feather edge variants have been used before. Available in a variety of heights (0.9m, 1.2m, 1.5m and 1.8m) they can be used with concrete or timber posts . 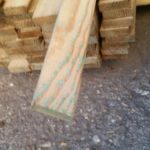 We can supply specialist ribbed timber posts for the ultimate decorative touch. 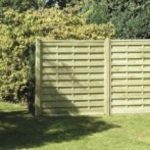 Depending on the size of the area that you wish to fence, there are a wide range of options you may wish to consider when choosing the right fence panels for you. First and potentially most importantly, you need to consider the purpose of the fence. Are you looking at fencing panels as a means of creating a boundary line between yourself and a neighbour? In which case, you may be happy building a low fence using fencing panels such as our 3ft picket fence panels. These panels will create a boundary line without distorting any views across neighbouring land (ideal if your land looks out to a country view or fields. However if you are wanting to build a fence will the intention of introducing some privacy into your garden, it is likely that our range of 6ft fence panels would be more appropriate. If you are looking for something more decorative then our horizontal lattice top fence panels with an incorporated trellis on top may be more appropriate. The type of fencing panels you choose may also depend on your budget. Oakdale Fencing Ltd stock a variety of different priced fence panels to suit any budget. 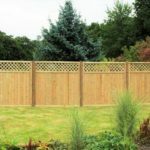 Our overlap traditional fence panels are available in a variety of size and will provide complete privacy. Tanalised fence panels are treated with a chemical preservative compound. This treatment helps to prolong the life expectancy of the fence panel. Tantalised fencing panels are more durable and resilient to fungus and rot. The tantalising treatment carried out on our fence panels is environmentally friendly and safe for pets and animals. This treatment can increase the life expectancy of fencing panels to up to 25 years. Our fencing panels come in a variety of different sizes to suit your fencing needs. Our fence panels range from 3ft to 6ft with a variety of different styles available. Below is a guide to fence panel heights and the amount of privacy they provide. This is the smallest size that Oakdale Fencing Ltd stock. While it offers little in the form of privacy, it will create a definitive boarder and help segregate land and define clear boundaries. This is the cheapest fence panel that we provide. This size panel will help you secure your garden and set a clear boarder line. Depending on your own height, these panels will be around chest height for many and still allow for visibility onto neighbouring land. These panel are also good for containing pets such as small dogs. These panels will add a level of privacy and help secure your garden. This height of panel may be appropriate if you are looking to build a garden fence but would still like to just a bout see over the top. 5ft panels would also be appropriate for containing most larger dogs. This height offers the best level of privacy and will also help deter potential intruders. It will likely contain ever type of dog and help secure your garden. Prior to carrying out your fencing installation it is important to ensure that you have chosen the correct type of fencing for your desired requirements. Oakdale Fencing provide a wide range of fence panels and concrete fence posts perfect for almost any fencing needs. If you would like any help regarding choosing the right fence panels please feel free to contact our friendly and knowledgeable customer service team. Start by digging the hole for your fence post, the depth and diameter of your hole all depends of the size of your fence, the height and type of fence. Before purchasing your fence posts and panels, make sure your fence posts are 2 ft longer than your fence panels. Before digging your fence post hole make sure the ground is clear, free of any old concrete or old fence posts that may still be in the ground. Then using your string line, mark out where you want your fence to go, make sure to get then exact measurements of your panels when laying the string line out and mark out where the fences post are going to be. Dig a 2 ft hole where you want your fence posts to go using a posthole digger. Once the first post hole is dug out, use a length of timber that is the same length of your fence panel plus half the width of your post to mark out the center point of the next hole. After digging your holes in accordance to your fence size and type, fill your post holes with 2 inches of ballast or gravel to allow drainage then level it out. Position the post in your hole on top of the 2 inches of ballast/concrete and make sure it is level. Once the post is in place and level, fill the hole half way with water, then pour in the Postcrete evenly around the post until no water is visible and its nearly at soil level. We advise around 3 bags of Postcrete per post hole. Postcrete/Postmix is preferred instead of concrete as it significantly reduces drying time and it comes ready to use, with no mixing required. We recommend that you use a dust mask, gloves and goggles whilst using the Postcrete, safety first! While the mix is still wet use your spirit level to check the post is still straight. The Postcrete will take between 5 to 10 minutes to set. When the Postcrete is set and the post is in place, finish off by covering the top of the hole with grass or soil. When all your fence posts are in place and the Postmix is set, lay a length of timber across the top of use posts and use your spirit level to make sure all your fence posts are correct and the same height. When you have checked they are all level, have your fence panel at the ready. Before putting your fence panels in place, fix your brackets and screw in to the panel. This will make it easy to fix the panel to post when holding the panel in the upright position. When you are sure the panel is in line with your post and level, fix panel to post. Fix until all panels are secure. (Optional) To finish the job we recommend adding post caps. They look good and most importantly help prolong the life of the post. Simply nail in to the top of each post with a nail long enough to go through the cap and penetrate the post so it is fixed securely.